Today has been a gorgeous day weather wise, quite unusual for February on the Isle of Man. I took the opportunity to play a round of golf with one of my radiology colleagues. He's been playing longer than me and is much more consistent. At my stage virtually everyone I play with is much better than me which I find quite nice. It means that I'm not under any pressure to do well, and if I halve or even win the odd hole it's an achievement. I started well today, with a 4 for par on the 1st and 4 for a bogey on the 2nd. Rest of the round went OK, with only a couple of disaster holes, a few decent drives and a noticeable improvement in my putting. 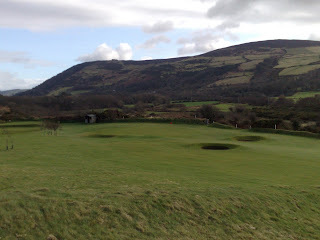 Had to play at Peel today - photo is of the 12th green - as they had a 'shotgun' competition at Douglas which meant the course was full. I've played Peel a couple of times before, and this was by far my best round there. 18 handicap by the end of the year is my aim, and I think it's at least possible. Got round to recording a couple of videos of me playing the piano and posted them on YouTube. First one is my attempt at a famous Chopin Nocturne. A couple of dodgy notes in there but not bad overall. Second one is a medley of old Queen tunes - Bohemian Rhapsody, You Take My Breath Away, Melancholy Blues and back to Bo. Rap at the end. Apparently Freddie Mercury played a Bechstein Grand on 'A Night at the Opera', so it's not a coincidence that my little Bechstein sounds quite close to the tone at the start of Bohemian Rhapsody - at least it does when you hear it live, rather than having been recorded through a mobile phone. When it comes to health service politics and management one of the biggest issues is the length of time patients have to wait for treatment, and I understand why this is the case. The problem is that the issue is far more complex than managers and particularly politicians seem to understand. For a long time in the UK waiting lists for appointments and surgery were far too long. It was a running joke in the NHS that you waited a year for an appointment, followed by 18 months for a scan and then a year or so for your operation. By spending huge amounts of money, which a number of my UK colleagues have spent on Lamborghinis and the like, the Labour government has brought waiting times for treatment down significantly. At least that's what we're told. Short waiting times aren't necessarily a good thing. They can lead to overtreatment. A number of conditions will resolve or improve spontaneously with time. If I saw and operated on everyone with a slipped disc on day 1 I'd be doing 90% of the operations unnecessarily. They also lead to inefficiency. If patients know they don't have to wait long for treatment there is a tendency to cancel appointments at short notice for seemingly frivolous reasons. Thirdly, a short wait for a specialist appointment means the GP's threshold for referral decreases giving a reduced conversion rate in clinic and a loss of balance between inpatient and outpatient work. There has to be a happy medium. The UK's 18 week limit from referral to operation is in my opinion too short and inflexible. If I made the rules they would be to aim to see patients about 3 months from referral, and to aim to operate on them within 3 months from the decision to do so. Finished my first OU maths course - a little ahead of schedule as it's not due until June. I got ahead as I wanted to finish the first course before starting the second in a couple of weeks. Last night I completed the final written assignment to send off to my tutor, and also the final computer marked assessment. This first course is worth 30 points which is a twelfth of the final degree, so at this rate I'll get my BA or BSc, whatever it turns out to be, in about 2014. Everybody gets back pain. More precisely, about 80% of the world will get a significant episode of back pain at least once in their lives. Mostly, back pain is self limiting, such that whichever modality of treatment is used (from nothing through physiotherapy, chiropractic, osteopathy right through to surgical fusion) it usually gets better. Most successful predictors for chronicity (that is long lasting) of back pain are employment status, social class, psychological profile and presence or otherwise of a legal case. Put simply, back pain will never be eradicated until everybody has a job that they like, plenty of money and somebody to love. Every clinic I do I see patients who have chronic back pain, and who hope that I will be able to fix it. Surgery can rarely, if ever, fix back pain. The same is true, even more so, for neck pain. There are of course rare exceptions where significant pathology is present, but generally speaking surgery has little role to play in the treatment of spinal pain. I often see patients whose expectation of treatment differs from mine. They come to clinic wanting me to fix them, and take my inability to do so as either an unwillingness to treat them or as a lack of interest in their problem. Neither scenario is true. As a surgeon, I've been trained to recognise problems that can be alleviated by an operation, and have learned when to operate and more importantly when not to operate. I can understand that patients with backache are looking for a solution. Unfortunately, a solution is often not available.